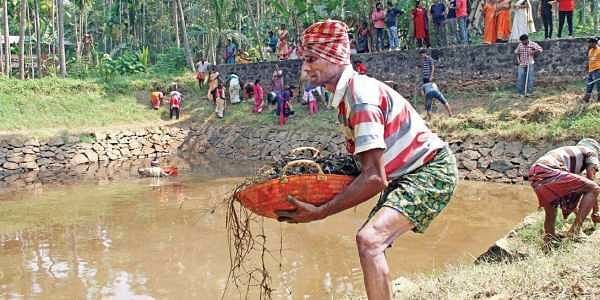 KOCHI: Following the success of the project for the revival of 100 ponds in Ernakulam, the district administration has come up with another plan named Jalasamridhi aimed at digging 123 new ponds ahead of the monsoon. Jointly implemented with the help of Mahatma Gandhi National Rural Employment Scheme (MGNRES) and Haritha Keralam Mission, the major objective of the programme is to enhance the groundwater level thereby solving the water shortage. The official launch of the programme will be held at Kunnukara grama panchayat on Sunday. District Collector K Mohammed Y Safeerulla will inaugurate Jalasamridhi. "We hope the desired results of the programme can be seen before this year's monsoon season. The ponds will act as reservoirs for rainwater and will enhance the groundwater level. This will also help in improvement of agriculture with the availability of more water," said project director K G Thilakan. As part of MGNRES, 334 ponds will be dug at 65 grama panchayats in 12 blocks this fiscal. "Out of the total ponds planned, 123 will be completed before May 31 this year. This will also help in providing more days of work to the workers," he added.